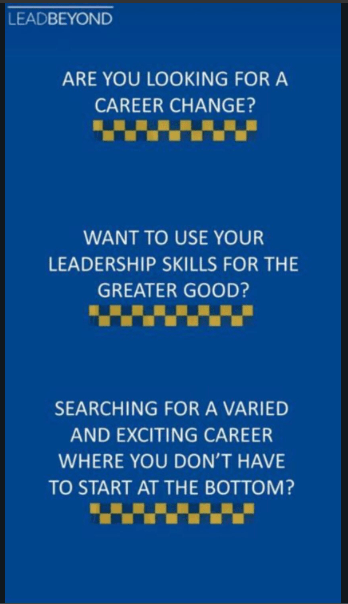 Officers kicked off on social media after the Met Police put out a job ad for senior management – saying they don’t have to start at the bottom of the ladder like PCs. The Met Police has launched a ‘lead beyond’ campaign, which allows direct entry into the force while completely bypassing being a beat bobby. But it was immediately dubbed ‘lead balloon’ and ‘lead by donkeys’ for denigrating front line police officers. The Lead Beyond twitter page has now announced that the offending ad has been withdrawn after the outrage it caused. The Lead Beyond campaign includes two different schemes – the superintendent programme and and the direct entry inspector programme. The inspector role will be be filled by a “forward-thinking, creative leader” likely “from a completely different background to policing”. Superintendent at New Scotland Yard, Roy Smith, said the ad, for the superintendent role, “shows a real lack of empathy and understanding of the frontline”. Posting it on Twitter, he said: “Just seen this on the Met’s Instagram. “I have to say without making a value judgement on the direct entry scheme I’m not sure ‘where you don’t start at the bottom’ is the way I would describe the frontline PCs and DCs who are the bedrock of the Met. “Lots of direct entrants have brought new ideas to the Met but if we lose sight of the fact that the frontline officers and staff who may not hold a ‘rank’ are the most important part of our organisation. “With experience and knowledge to rival the best. The ad poster read: “Are you looking for a career change? “Want to use your leadership skills for good? John Apter, national chair of the Police Federation, said: “Really disappointing to see this and sends completely the wrong message. Sergeant Ben Forbes, based in Essex, said: “Completely not the way Mike Cunningham, who heads the scheme, would promote the direct entry (DE) programme, especially in the talks I’ve heard. Head of the Met Police Federation, Ken Marsh, described the ad as “disgusting”, claiming it sums up “how little they think” of his colleagues. He said: “That is disgusting. “To me this just sums up why we are in the position we’re in in relation to recruitment. “One of the unique things about the police is that everyone starts at the same level. “You start at the same level and you learn at the same level. “When you have elite departments like this that claim they’re better than the frontline it causes problems. “You have to learn your skills at the start. “That ad tells you how little they think of my colleagues who are already there. “It hits moral and the common decency of these individuals who work morning, noon and night. Instagram users slammed the campaign itself, with one calling it a “terrible step, lions led by donkeys”.